A script designed to render and trim audio events. It can be especially useful for audio from an external recorder. Once synced, it can be added to the original event as an audio Take, thus ensuring the external audio remains in sync with the original. Events. Multiple events may be selected from a single track. Loop region. If selected, the loop region will be rendered to a New Track. The tracks to be rendered must be selected in the Select Tracks box. Regions. If selected, all regions will be rendered to a New Track. Project. The entire project will be rendered. Audio FX to Keep. The user may specify which audio FX should be kept. During render, those unchecked FX will be temporarily disabled. Upon render completion, they will be re-enabled. Select Tracks to Include: The user may specify which audio tracks should be included in the render. A track with *** indicates it to be the one with selected events. If another track is selected, it may then be added as a Take to the selected event, useful to add audio from an external recorder to the original audio from the camera. 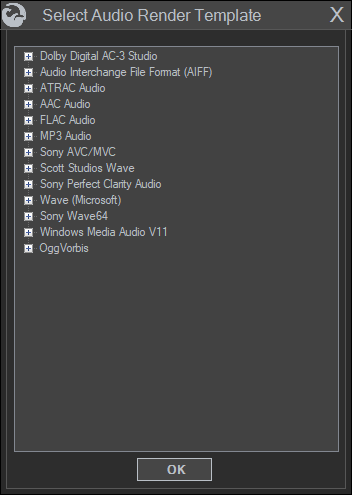 Audio Render Options. For stereo projects, the default render template is Wave (Microsoft), 48,000 Hz, 16 Bit, Stereo, PCM. For 5.1 Surround projects, the default render template is Wave (Microsoft), 48,000 Hz, 16 Bit, 5.1, PCM. Set Vegas Audio Out Template. If checked, the user may choose a different render template. A left-click on the blue gear icon opens an audio render dialog from which a new audio template may be selected. When selected, the new template will be shown in the textbox. Time Added. The number of seconds added to the head and tail of each audio event. This option can be used only if a single track is selected. It is useful for trimming a long audio file and keeping only those portions within the selected event. After render unmute tracks. During the render, those tracks that are not be included will be muted. If checked, all tracks will be unmuted upon render completion. How to Save. There are three save options that partly depend upon what is being rendered. In all cases, exisiting files will not be overwritten. In the event a file already exists, a numerical suffix will be added to the file name. Add as Take. This option is available only for Event renders. If selected, the rendered file will be added back to the original event as a Take. An advantage of this option is that the rendered event always remains in sync with the original event. Render to New Track. This options is available for all types of renders. If selected, the rendered file will be added to a new track entitled “Trimmed Audio”. Save Only. If selected, the trimmed file will just be saved. It will not be added back to the timeline. No synchronization between the trimmed file and timeline event will occur. Add File Tag. If checked, a File Tag will be added to the name of the rendered event. The desired name can be entered in the textbox. Sub-folder of Media File Folder. Rendered media files are stored in a sub-folder in the folder where the media file is located. The name of the sub-folder may be entered into the textbox on the right. This option is available only for event renders.